While I was in LA a few weeks ago, I checked in with Dave by phone and he asked how close I was to San Jose… It turns out that he had purchased yet another centrifuge and wondered whether or not I wanted to pick it up and fly it home. No, I didn’t, and when it finally did arrive, I realized that he had *most likely* been joking. His new, Jouan centrifuge is “bench top,” meaning it can sit on a table (or bench), but it still weighs over 150 lbs. Why yet another centrifuge? Dave wanted a centrifuge that could handle larger volumes of juice clarification – the Jouan does about 4,000 g’s and can handle up to 3 litres of liquid while the dangerfuge only handles 400 ml at most and the Unilever-fuge can only do about 1.5 litres. Of course, that was before Dave broke the agar clarification technique. Now that we use the agar clarification method, using the Jouan for juice clarification isn’t really efficient. However, we are able to do larger quantities of our nut oils, not to mention the other applications that we will surely find the new ‘fuge useful for. The Jouan ‘fuge also speeds up and slows down a lot faster than our old ‘fuges. For example, the dangerfuge never slowed down and Dave would sometimes manually stop it by holding a piece of rubber against it until the friction finally stopped its rotation. The Unilever-fuge took at least 5 minutes, sometimes more, to come to a full and complete stop. The Jouan usually stops spinning in under a minute-twenty. There’s also the added safety benefit: the Jouan is the safest of all our ‘fuges. The dangerfuge was aptly name because it’s potentially deadly and the Unilever ‘fuge allows you to open the chamber while the rotor is still spinning, if you’re dumb enough to try. The Jouan adds that extra layer of idiot-proofing by locking the chamber anytime the rotor is in motion. Unfortunately, the chamber isn’t refrigerated, though, so Dave needs to figure out an alternative way to chill it at some point. The chamber isn’t air-tight and allows for ventilation, meaning that we may be able turn to Liquid Nitrogen in the future as a potential chilling method. Stay tuned. Before we even used our centrifuge, however, we needed to sterilize it since it was most-likely used to spin blood in its past life. The best way to sanitize the Jouan’s buckets would have been to use an autoclave, which sterilizes medical equipment by using high-pressure steam. Since we didn’t have ready access to an autoclave, Dave (as usual) MacGyvered an alternative: he pressure-cooked the Jouan’s buckets at 15 psi for about 2 hours after soaking them in a concentrated bleach solution overnight. We (read: interns) also cleaned the interior and exterior of the machine with a concentrated bleach solution and let it air-dry, repeating this process several times. The Jouan contains 4 swinging buckets that load in upright and then spin out so that they are horizontal while spinning. While the Jouan both speeds up and slows down much faster than either of our previous ‘fuges, nobody (read: interns) was happy about the idea of a bucket potentially dumping liquid back into the chamber. Dave came up with yet another solution: vacuum bags. Using a plastic sealer that we use to double seal our vacuum bags (as the factory seal isn’t really a seal at all so much as it’s a line of somewhat melted together plastic), he clamped the bottom corners of the vac bag so that the bottom of the bag is now flat with the original edge running down the flat bottom’s center. The bag is then placed in the bucket, filled with nut or olive purée, etc. (Robo-couped and then Vita Prepped), and then the top of the bag is sealed (not vacuumed), meaning that the product is completely contained within the bag, never touching the sanitized buckets, and having no ability to shoot out of the bag and all over the inside of the centrifuge chamber. No mess spinning. 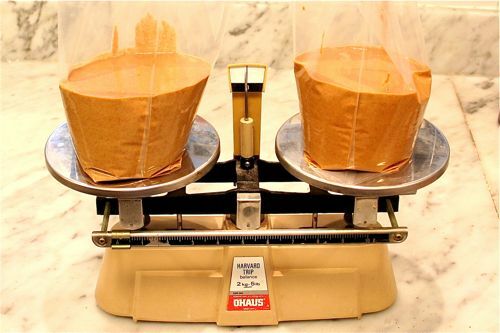 As usual, we weigh whatever we are spinning to make sure that all buckets are within 2/10ths of a gram of each other. Dave also purchased a Harvard Trip Balance that helps us do just this ($15 eBay), and it happens to be accurate to within 2/10ths of a gram. Convenient. Another added benefit of the Jouan’s swinging buckets is that it creates better stratification of the solids and liquids after spinning. Before, the fixed, slanted cup-holders in our other ‘fuges meant that we would get angled layers. The better stratification is particular fun when doing cured olive oils – we’re able to separate both a flavorful oil and a delicious olive brine from the cured olive purée. The brine makes for a damn good dirty martini. left to right: nut purée pre-spin and then nut oil sitting in a perfect layer on top of nut solids. Dave has also found a curious phenomenon when spinning nut purées dosed with simple syrup: you’re able to pull a clearer, but less flavorful oil. He’s not really sure why this happens yet – please let us know if you have any thoughts on why this occurs. 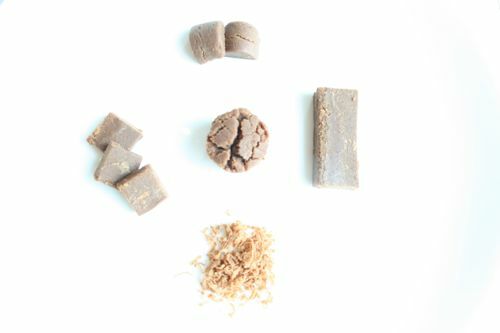 The nut solids that are separated from the oil also become denser, allowing us to mold them into little bricks which can be cut and even grated. 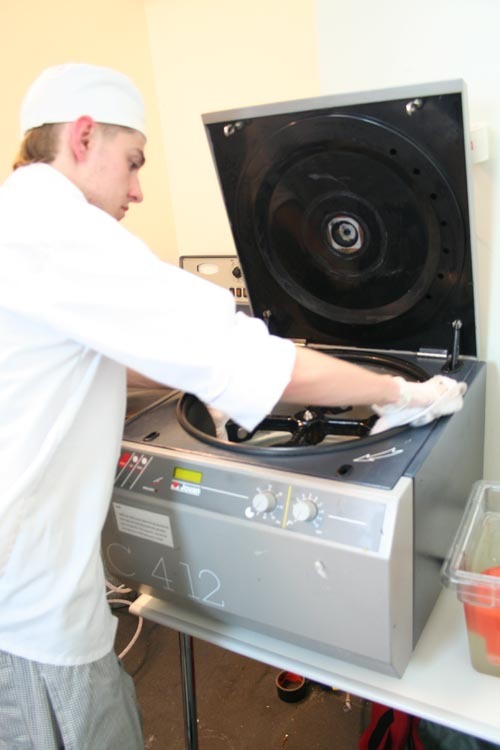 In Dave’s eyes, what really separates the Jouan from our other centrifuges is its lab-to-kitchen crossover potential. 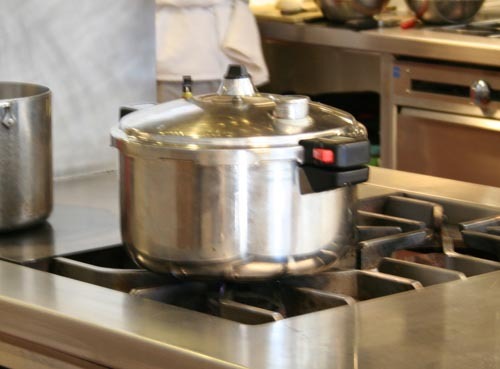 Its size and relative-affordability mean that should we find more applications for food and centrifugation that warrant its purchase, chefs could easily add it to their kitchen equipment. So far, we have spun: avocados (both puréed & whole for a laugh), tomato paste (which yields a minute quantity of the most intense-flavored tomato liquid in the world), pecans (with and without simple syrup), walnuts, pistachios, macadamia nuts, almonds, Marcona almonds, peanuts, and cured olives. Here is our offer and request: since we already have the centrifuge, please share with us any spinning ideas and requests that you would like us to try. Who knows, maybe the centrifuge will follow the path of the immersion circulator someday and find a new home in the restaurant kitchen. i have been thinking about an herb consomme for a while now, but obviously am not in the place to get a centrifuge yet. so an herb consomme is my vote!! 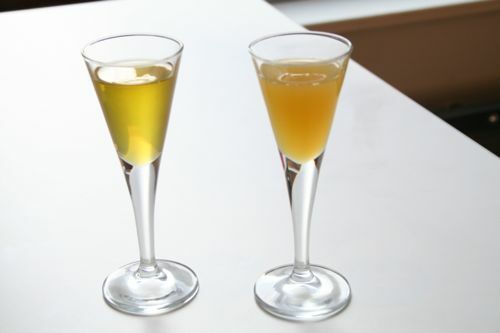 as well as an eggplant water consomme, i actually dreamt that i made one so thats why i want to do one now, in my dream i made eggplant consomme cooked it down and put it with kumquat and lamb. Try agar clarification on that one. Water it down, clarify, and reduce. Nice! How much does it cost without the spelling error ;-)? Can’t wait to see it! After the cook in germany blew off his hand (mis)handling liquid nitro recently there were few interesting articles about that. They stated that even with proper ventilation the nitro can cause cracks in normal containers which can lead to explosions as well. I am not sure how true that is but it might be very good to have a "primer" about Liquid Nitro and safety. Certain metals get very brittle at cryogenic temperatures, including steel. Some stainless alloys are ok. I’ve usually been ok with 304 stainless, but once I had a bain marie split wide open on me. I’m trying to figure out how that can cause an explosion on the order of what happened to the cook in Germany. I’ll try to find those articles. After what happened we are definitlely going to do an LN safety primer, but what’s interesting is that even among laboratory professionals, there are disagreements on things like the proper use of protective gear. I think this is because university policies are often written by safety officers and not by the people best versed in the peculiar characteristics of LN. Obviously the main issues are: cold burns, asphyxiation, explosion (by accidental confinement), and precipitation of liquid oxygen. Wow. Hear that guys, never tamper or modify with safety devices. I’m glad no one was hurt. You can run the centrifuge in a walk in to keep it cold. Who was the user you bought from? I’ll check to make sure it wasn’t the guy we used. do you know that there are Jouans (or Genevacs) than you can pull vacuum to as well? That way you can dry down sensitive stuff, without boiling over (similar to in a rotavap). Now you spin the fuge and your pit feels 4000 G.
Change to bullet time in your imagination (from the Matrix). As soon as it starts to bubble and a droplet wants to jump out of the pit it gets forced straight down again. No spilling, very mild dehydration conditions. If you find one, you’ll love it! Some German style liver sausage, or purred block de foie gras if you want to go fancy. You might be able to extract some clear fat from this to make colorless liver sausage tasting oddities. Chilled Ouzo (< -20°C): You could separate the fine crystals of "super Ouzo taste" from clear less intense schnaps. Boiled beef (Tafelspitz style) Take out all the liquid (to make a delicious gel) and reconstitute the meat with some other liquid to generate a surprising effect. (Maybe you puree shrooms (start with simple Champignons) and fuge them as well, yielding some intense mushroom tasting liquid? Finally some hypothesis to the effect of the syrup. Maybe it simply adds the amount of aqueous phase to your system to keep the fine particles in there rather that in the oil phase. Can you run controls by simply adding a bit of water (or some agar gel from pure water) to the nuts as some in situ clarification aid? It’s possible that the simple syrup is helping add an aqueous phase, but I think it more likely that the sugar is creating a density gradient which can enhance fractionation of suspensions. Citrus essential oils. 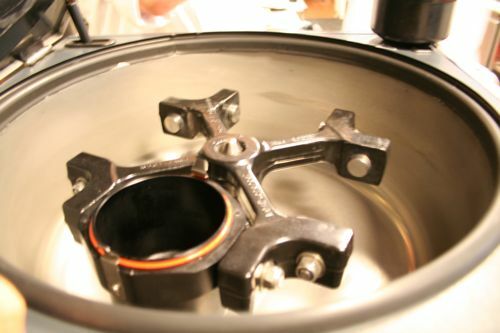 Can the centrifuge be used to extract essential oils? Cold pressing. What happens when you cold press in the centrifuge? What about herbs and spices, previously pulverized with liquid nitrogen into a fine powder and then spun? The results could be exciting. And pure chorizo oil should just be tasty. What is the essence? What makes food its distinct self. Is there a difference between raw and cooked foie gras fat? What would happen if it was spun in the centrifuge? Can you make an existing herb oil cleaner? Can you clean up olive oils with sediment? What about the oil pressed or extracted from cured olives, powdered first with nitrogen and then spun? Do these now have a different and characteristic flavor? What about powdered coffee beans, can we get the essence or just the intense oils from them? Does the roast on them matter? A few ideas just bouncing around. We’ve tried straight peels at 4000 g’s but no luck. We’ve tried peels’n liquor (got a bitters). We need a pre-treatment or something. How about peels and water? You want the oil to separate out, not dissolve in the medium. We havent spun ln pulverized spices. Herb oil doesn’t do much at 4000 g’s but we just spun it at 8000 g’s in our superspeed. Beautiful color and really clean tasting. I might post on it. Problem is, 8k g’s is outside the range of small bench fuges in reasonable quantities. About the olive oil with sediment. I’m still trying to figure out why mixing simple syrup (water works as well but ss is better) with our nut pastes gives a clear oil while spinning alone does not. I wonder if we semi-emulsify an oil with a water based product and spin it we can get clear oils. Dunno. We’ve done cured Kalamata olives. It was the second thing we did. I love it. You don’t need to powder it, jus spin it. I thought we posted on it but maybe not. Its awesome. You get 3 layers, amazine brine, flavorless paste, amazing oil. Coffee won’t tast like coffee till it is roasted. We haven’t had luck spinning things that don’t have a large fraction of free oil in them. Avocados don’t work. We are trying to source an enzyme that will break the cell walls and give us access to the oil. That might work. Who needs an enzyme when you have a homogenizer? Normally you’d use plastic centrifuge bottles inside the buckets, or centrifuge tubes inside the plastic liners that fit into the buckets, but for your applications (where you need ready access to both the solid and liquid phases) your homemade cryobags probably make the most sense. And regarding refrigeration, the simplest thing to do is probably just set up the centrifuge in a corner of a walk-in refrigerator – that’s pretty standard practice in a lot of labs. Good idea on the fridge. It looks like you’ve turned the nut paste into halva. Try adding syrup at hard ball stage for more crystallization. If the syrup-dosed oil is less flavorful, is the paste then more flavorful? Where did the flavor go? Since sugar [and water] is the only variable, could it be that the oil was further clarified hygroscopically ? I’d be interested to know what happens to heavy cream in the centrifuge– can the fat be separated from the milk solids or will it churn to butter? In a chemistry labe we very often use separatory funnels to seperate an aqueous layer from ans organic layer e.g. hexanes or ethyl acetate but fat (oil) would be the same story. Anyways once in a while your phases don´t separate nicely, you keep an emulsion. The most effective additive to help break that emulsion is a few mls of methanol (stop, don´t try this but ethanol (go head) does the trick as well. Therefoe maybe adding a shot of booze to the nut puree will work like a charm! As you certainly know, but maybe not all readers, glucose is a poly-alkohol, from a chemical standpoint, so maybe that does explain why SS is so effective…. would cerial grains work like the nuts? 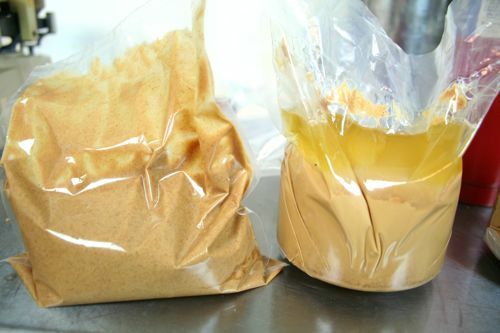 in refernce to beer brewing, powdered malt or malt extract is available. would be interesting to find out and to see the result used to brew a batch! what about hops? that has oils and resins. vita mixed corn? what about fish, how to they extract fish oils, how many fish do you need? do the beer one, and brew some up, i dont have the fuge or i would try it. I posted a reply about the nut centrifuge on the agar clarification page (silly me) proposing a simple explanation of what might be going on but I must commend Schinderhannes for his interjections, sounds like something worth doing. Just as we were talking about this, I found a fuge! It was in a pile of trash outside an animal hospital in Chelsea yesterday. Took it home and bleached the rabies out and it works perfectly. The capacity is only 6 x 15ml, but the price was right. I’m gonna try the kalamata separation. Any other suggestions for small-scale, quick-gratification My First Centrifuge projects? Go on line and look up the RCF vs rpm values for your rotor/fuge combo. Also, do you have 15 ml tubes or are you putting stuff directly in the rotor? I have a handful of fresh 15ml polypropylene tubes. The RPM rating scrawled on the back of the machine is 3,146. The radius is about 250mm. I see on the web that RCF = 1.12 times the radius, times (RPM/1000) squared. So I’m getting an RCF of about 2,770. Better than a salad spinner! Decidedly better than a salad spinner. Let us know if you find anything good. We are working on trying to flesh out our applications. Second the walk-in fridge idea, we kept one permanently in the 4C room. Now to find an ultra-fuge for a reasonable price . . . 15,000Xg does some fun stuff with DNA extraction, why not with food? Greetings, a friend forwarded your site to me. I work as a biochemist by day and cook by night. 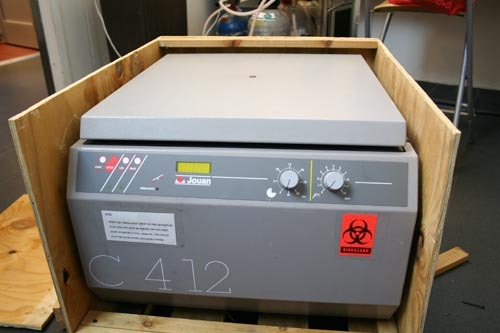 You have picked up a fine centrifuge, I work with a similar model with a built-in refrigeration unit (CR422). Those Jouan centrifuges are built like tanks… I would guess your machine is at least 20 years old if not more. Jouan as a company however hasn’t lasted as well and was bought out a few years back. Your rotor should have some important information stamped on it, serial number, model number and more importantly a MAX SPEED and EXPIRATION DATE. Max Speed is the rated speed the rotor can handle with the maximum load (for this model probably 5k or 6k). For this model I would guess the load is the equivalent of all buckets containing a 500 ml flask (so 0.5 kg per bucket or 2 kg for a fully loaded rotor). It is not advisable to load the rotor beyond this as you risk a catastrophic failure (mass, acceleration, kinetic energy, metal fatigue blah blah blah). Centrifuge failures are a serious thing- there is a very real risk of damage and injury when these go- that’s why the chamber is made of steel armor. Try a Google image search for “centrifuge failure” and similar terms some time. Expiration Date is the date when the manufacturer no longer guarantees the rotor to be suitable for use at max speed assuming a typical duty cycle. Many people use rotors for years (decades?) beyond this point without incident, but if it fails you can’t sue anyone. This gives you an idea of the age of your rotor and can you decide if operating it a max speed under a full load is really a good idea. Many labs will knock 500 or 1000 rpm from the old max speed and tape a note next to the speed dial, successfully depreciating (or “de-rating” in centrifuge jargon) an old rotor. Keep your eyes open for flask holders for your buckets. Many of these flasks are perfect for centrifuging large quantities of liquid or slurry. Check out the various flasks what Nalgene sells… these could be a lot easier than using a vacuum sealer, plus the shape of many of these bottles are designed to make fractionation of your samples easier. Your simple syrup idea reminds me of a technique called a sucrose cushion. It involves sedimenting large particles through a dense aqueous liquid (sucrose solution) at the bottom of a centrifuge bottle, everything that is soluble or too small to pass through the cushion is retained in the sample- it’s a great way to do fine fractionation. Make a saturated solution of sucrose (table sugar) in water, fill a pipette (or turkey baster) with the solution, put the tip at the bottom of the bottle (with your sample already in it) and gently expel the sucrose- do not blow out the pipette as air bubbles will disturb you gradient. After centrifugation you will see large debris below the sucrose, use a pipette to draw off the debris and the sucrose. Of course this only works when your sample can tolerate contamination with sugar (this might be useful for desert preparations?). Experiment with different speeds to get an idea of how fine of fractionation you can achieve with this technique. Bottom pipetting dense liquids is also a great way to make layered mixed drinks. Finally, if you are interested in buying old laboratory equipment you should really check out the website DoveBid. They are a liquidation outfit that often sell off equipment from old pharmaceutical research labs. Lots of neat stuff shows up there and the prices are usually good (I attribute it mostly to the people running the auction not knowing what the things they are selling are). As these listings are not usually written by scientists there are some good typo bargains there too.